Sticking to the store’s perimeter. Though every grocery store is different, each has a similar setup: prepackaged and frozen goods are kept in the inner aisles, while produce, dairy, meat and baked goods are found along the outskirts. Because fresh, minimally processed foods will be the best for your weight loss diet, you should aim to make the vast majority of your purchases along the outer edges. Fill your cart with fresh fruits and vegetables, lean protein, whole grains and low-fat dairy products, and forget about the empty calories in the middle of the store. Planning ahead. You may already make a list before you shop, but do you stick to it? Most of us end up making a few impulse purchases, tempted by delicious sights and smells that make us forget our better judgment. To keep yourself from bringing home a dietary disaster, plan out everything you’ll buy and refuse to deviate from the list. Shopping full. Even if you’re devoted to your list, a grumbling stomach can break down your willpower to avoid unhealthy purchases. When we’re hungry, we’re much more likely to give in buy something we regret or give in to tantalizing free samples. To avoid this issue, shop after a meal or eat a healthy snack before you hit the store. 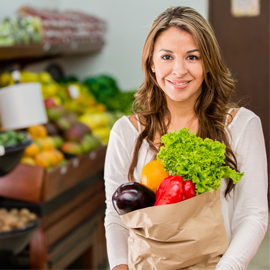 The grocery store can be your best friend or your worst enemy after medical weight loss in Los Angeles. Use these tips to help yourself make good choices at the supermarket, and if you have any more advice, please share it in the comments below!